As you know (and love), Cerkl automates your newsletter and personalizes the content each of your subscribers receives. We have a few handy ways to maximize the reach of your Cerkl content. As you create content in Cerkl, you'll notice a few optional settings toward the end of your edit page and in your Distribution Settings found by clicking on the yellow gear in the right hand corner of the screen. Publish Dates - the default settings for the "Publish Date" of your content is the instant you press "Publish" at the bottom of the page. Change the "Publish Date" to a date in the future if you'd like to wait to publish a story. The default settings for "Expiration Date" is left blank. 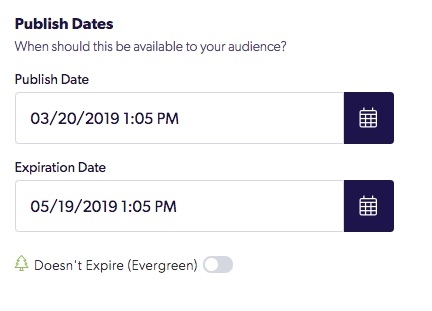 If you have content that has an expiration date, change the "Expiration Date" to match the date. Then, it will no longer be sent in newsletters. However, it will still be live in your Content Archive for review. This content will still only appear if a subscriber is interested in it. If you'd like everyone in your Cerkl to see it, head to Distribution Settings. To access Distribution Settings, go to your Content Manager, click on your Content Icon of choice, and then find the yellow gear at the top right hand corner of the screen. This will prompt a sidebar to appear with various settings for you to control. The first option is Posting Priorities. This allows you to control to whom you want the content to be sent. The default option is what we recommend for most content. It will send articles out to subscribers based on their chosen interests and their interactions with past articles. This where Cerkl shines in understanding what content your subscribers want to engage with. 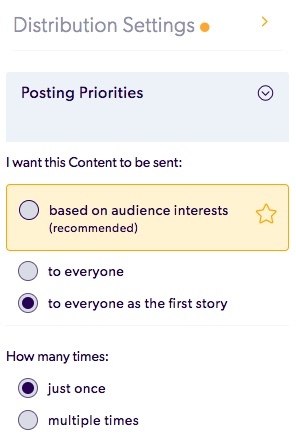 The second two options are provided for occasions when you have a piece of content that you want all subscribers to see regardless of their interests. The "to everyone option" will include that piece of content somewhere in every newsletter but not necessarily at the top of the newsletter. The "to everyone as the first story" will guarantee that this piece of content shows up as the first story in everyone's newsletter regardless of their interests. Both of these priorities have a "How many times" choice. This will allow you to choose if you want that piece of content to appear in everyone's newsletter just once or multiple times. 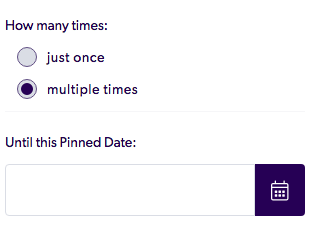 If multiple times is selected, you will be asked to select a "Pinned Date". This content will appear in every newsletter until the selected pinned date. 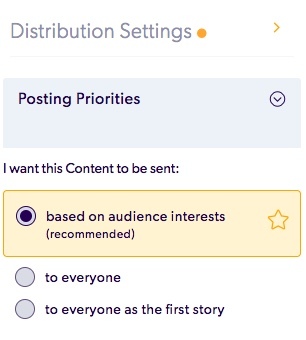 The second set of options found in Distribution Settings is around the Segments you would like to send a piece of content to. If you use this feature, you can narrow the audience for your content based on segment. You can check one or multiple segments for each piece of content. 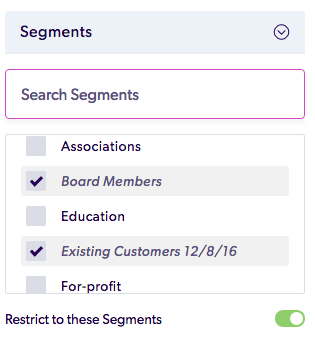 Cerkl recommends using our "Segments" feature for different demographic information about your subscribers (i.e. location, age, gender, occupation, etc). You can add new segments under Audience > Segments. There is also an option to make sure that a certain piece of content is sent only to a specific segment or segments. You can make this adjustment by flipping the switch "Restrict to these Segments" on. Lastly in Distribution Settings, you can choose whether the content is shown in Aptly, and if you would like to allow comments.